President Trump offered a combative New Year's message on Tuesday, mocking critics of his whiplash governing style. “HAPPY NEW YEAR TO EVERYONE, INCLUDING THE HATERS AND THE FAKE NEWS MEDIA! 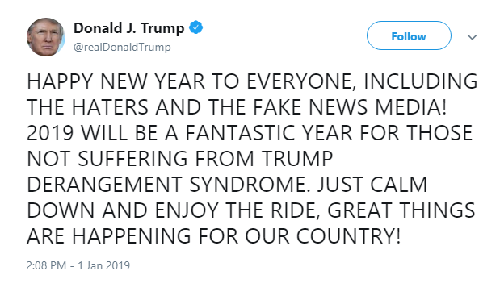 2019 WILL BE A FANTASTIC YEAR FOR THOSE NOT SUFFERING FROM TRUMP DERANGEMENT SYNDROME. 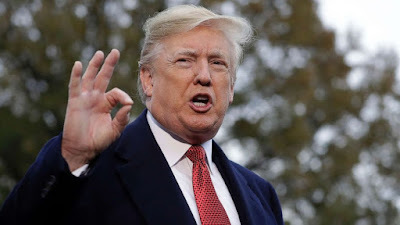 JUST CALM DOWN AND ENJOY THE RIDE, GREAT THINGS ARE HAPPENING FOR OUR COUNTRY!” Trump wrote in a Twitter post kicking off the latter half of his first term in office.